Regular readers have probably noticed by now that I'm not posting on my blog much anymore. I've decided to put Cook In / Dine Out in semi-retirement after 5 tasty years. I will still post occasionally, but I won't be as active either here or in social media. 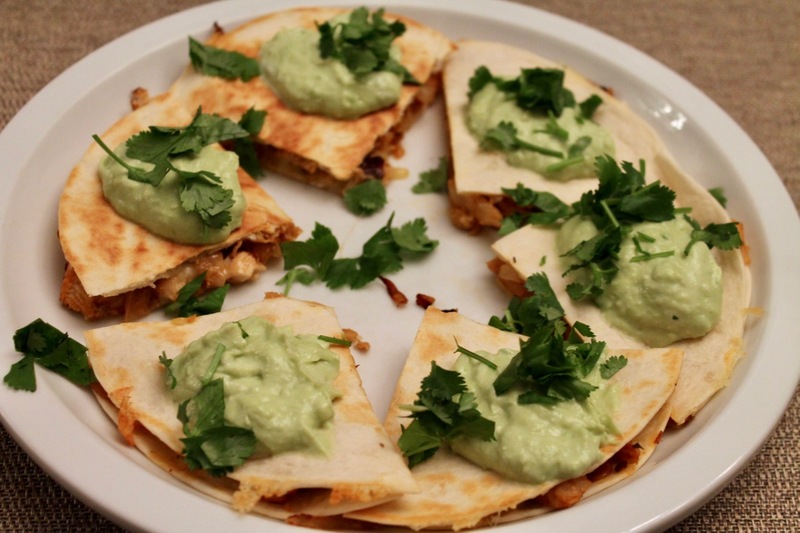 That said, I do plan to post new recipes on occasion if I have something really good, and I think these chicken quesadillas qualify. I love the spicy-sweet flavor of chipotles-in-adobo here. The first time I only used one, but it wasn't spicy enough for me. How much chipotle to use will be a matter of how hot you want it. I'd call this a "medium" heat level. 1. Heat olive oil in a large skillet over medium-high heat. Add the chicken, season with cumin, oregano, garlic powder and seasoned salt, and sautéed until browned and cooked through, about 10-12 minutes, turning over at the halfway point. Remove the chicken from the pan. After the chicken has rested a couple minutes, chop it into 1/2-inch chunks. 2. Add the onion to the hot pan and sauté, stirring occasionally, until browned, about 8-10 minutes. Stir in the minced chipotles and the chopped chicken. Squeeze the half lime over the mixture to deglaze the pan. Turn off the heat. 3. Heat a 10-inch frying pan over medium heat. Place a tortilla in the pan, then sprinkle evenly with a portion of cheese. Spoon about 3/4 cup of chicken mixture on top of the cheese, spreading it in an even layer, then sprinkle another portion of cheese evenly on top before topping with a second tortilla. Cook for 90 seconds until the bottom tortilla is lightly browned, flip (recommend using a wide spatula) and cook for another minute. Transfer to a cutting board and cut into fourths. Repeat two more times with the remaining ingredients to make 3 whole quesadillas (or 12 fourths when cut). Garnish with avocado-yogurt and cilantro leaves. In a tall container, combine the avocado, yogurt and lime juice. Blend until smooth with an immersion blender (alternatively, combine the ingredients in a food processor or standard blender and pulse until smooth).